When you’re in the mood for Italian fine dining, you should consider Carpaccio Tuscan Kitchen in Annapolis. Two of my friends were celebrating birthdays and this was the perfect excuse to try a nice restaurant. We walked into the dining area with an open kitchen accompanied with comfortable booths and table seating, mood lighting, white table cloths, generous portions of food and, of course, great wine. Carpaccio is nestled off of the corner of the Westin Hotel on West St. and Park Place at the top circle in Annapolis. This is a cozy yet classy venue that is not too big and not too small. You can dress on the nicer side for dinner and not feel out of place and there are also several seats available at their long bar if you’re feeling more casual. Our group of 8 had reservations and a table waiting for us. Luckily, my appetite was subsided by their fresh pizza bread that our waitress brought out while we were trying to decide on our orders. I would have been happy with just the pizza bread and my wonderfully fresh salad but I decided to try more of the menu. The kitchen graciously split the salads on two plates for my friend and I to share. 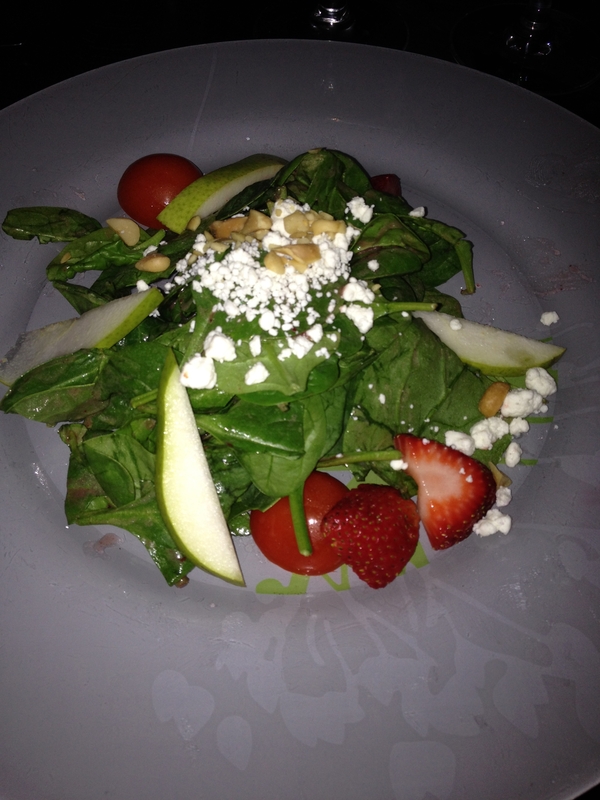 This is half the ORGANIC BABY SPINACH SALAD with fresh pears, fresh strawberries, goat cheese, macadamia nuts and raspberry vinaigrette. CALAMARI FRITTI is delightful and light. Crispy calamari is flash-fried to a golden brown, served with a duo of dipping sauces. 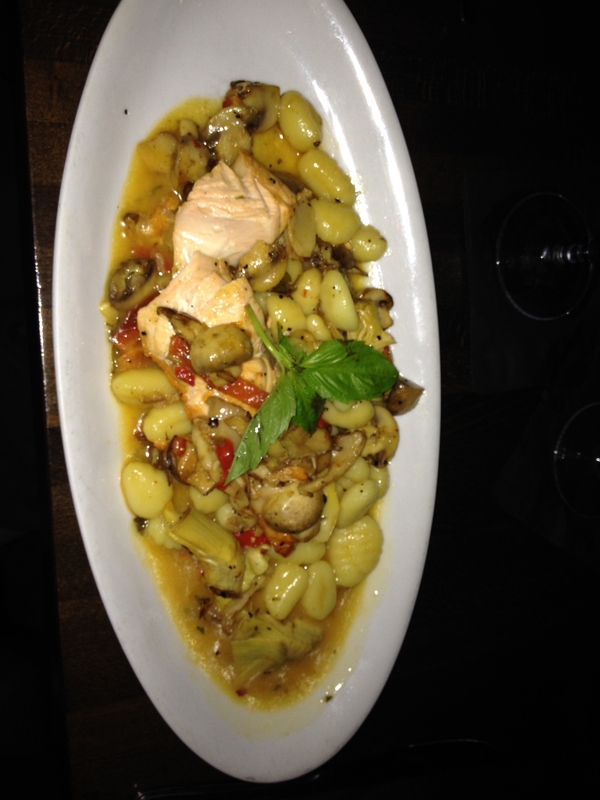 SALMON CAPRICCIOSA is filled with goodies like pan seared Norwegian Salmon with artichoke hearts, roasted red peppers, and mushrooms, all served in a white wine lemon sauce over homemade gnocchi. LASAGNA BOLOGNESE has the perfect consistency. This meat lasagna has ricotta and mozzarella, and tomato ragu. 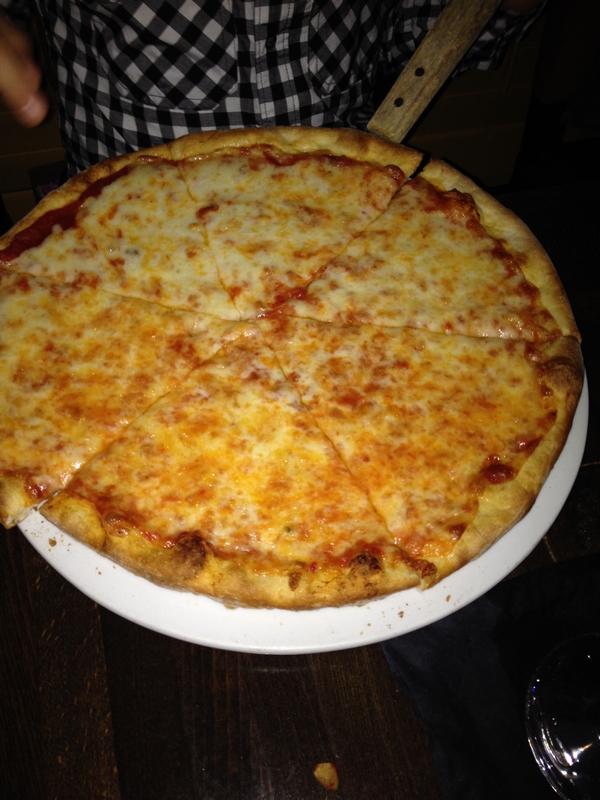 MARGHERITA is large enough for several people. The classic Neapolitan pizza, zesty tomato sauce, fresh basil & fresh Mozzarella Cheese. RISOTTO LAMB MILANESE was so tender it was falling off the bone and reminded me of beef stew. 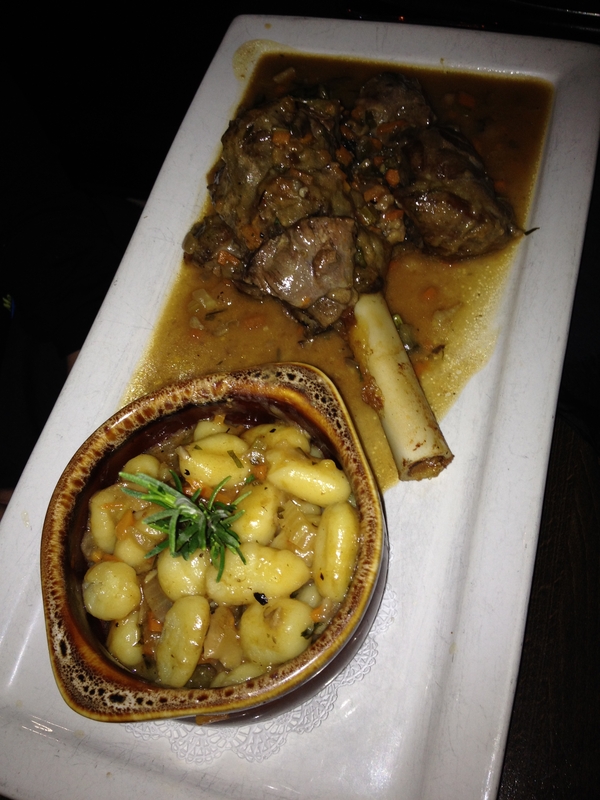 Braised lamb is served with finely chopped caramelized onions, carrots & wild mushrooms in a saffron parmesan risotto. The portions are huge and we had to box up leftovers to take home so that we could fit in dessert. They served CANNOLIS for the birthdays and we also had to try the delicious CHEESECAKE (homemade cheesecake wins over Cheesecake Factory any day). The FLOURLESS CHOCOLATE CAKE was also light, yet rich, and rounded off the perfect evening. Cheers to another year of good health, happiness and adventures for my birthday friends!